Preheat oven to 150 °C. Grease a muffin top pan or baking sheet. Separate eggs and place egg whites and 1/8 tsp of cream of tartar in one bowl and beat with electric mixer until stiff peaks form. In a separate bowl place egg yolks, salt and cream cheese and beat until smooth. Fold egg whites gently into egg yolk mixture. 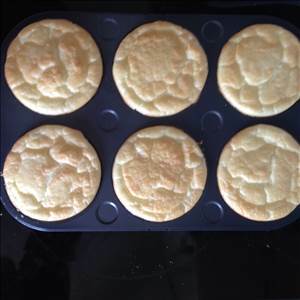 Scoop 6 servings into muffin top pan. If baking on a sheet, flatten slightly with back of spoon. Bake for 20 minutes and check as you want them a light brown colour and soft, not crumbly. Bake another 5 minutes if needed. Let cool in pan for 2 minutes and then remove gently and place on cooling rack. Can be stored in a zip lock bag in the fridge, but leave partially open so they stay dry and don't get too moist. There are 95 calories in 1 serving of Low Carb Bread - Oopsie Rolls. Calorie Breakdown: 79% fat, 3% carbs, 19% prot.